The idea of placing very young children, even infants, in the care of those who are not their parents is daunting for families on many levels. It raises so many questions: Will my child get the love and attention she needs? Will he really be cared for the way I would care for him? She is so smart…will she learn new things? But, perhaps most importantly, can I even find good, safe child care? And if I find it, can I afford it? In looking into these issues, most parents learn that good child care is not easy to find and that it comes with a hefty price tag. While states and the federal government are recognizing the value of early education and the need to put funding into this area, that funding also comes with caveats, which create their own issues for both families and child care providers. Like “food deserts”—communities that lack access to grocery stores and fresh produce—many communities also are now labeled “child care deserts.” A 2017 study of 22 states by the Center for American Progress found that more than half the children in this country live in areas with few or no options for care for young children. While the federal budget provides a boost in child care funding, there are “proceed with caution” signs for quality and equity in how it will be used. The $5.8 billion is part of the Child Care Development Block Grants to states over the next two years, and how it is used will be determined at the state level. Even the recipient agencies of these funds are questioning the quality of the care that will be provided to the low-income clients. Hence, the regulations that come with the funds. In DC, the recipients of these funds will require that teachers and directors have bachelor’s degrees or early childhood certificates to teach in their programs. But other states will not. And with these requirements for staff, come the questions of compensation for staff. 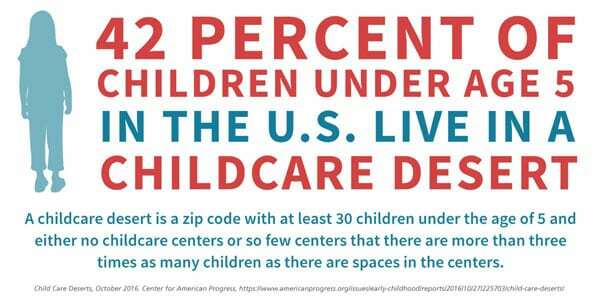 Child care can be incredibly expensive, often costing families as much as 20–30 percent of a family’s household income, according to the advocacy group Child Care Aware America. But most child care workers are paid $10 an hour or less. Some efforts are being made to fill the gap. In Alameda County, California, whose county seat is Oakland, a ballot measure this June “would have raised the sales tax a half-cent for 30 years, bringing in about $140 million a year to increase pay to $15 an hour for child care workers and expand access to child care for low- and middle-income parents.” The measure received 66.2 percent “yes” votes, but narrowly failed because it required a two-thirds vote for approval. Given the close call, a similar measure may be placed on the November ballot to see if the second time a two-thirds majority can be obtained.